Can You Imagine a Silent Forest? Can you imagine a silent forest? What if there were no birds, insects, or other creatures in the forest? This is a very real possibility through the devastation that using genetically engineered trees in reforesting programs or other plantings could bring about. This subject is one that has serious consequences for us today, and for future generations, as well. Trees are one of the most important parts of nature that ensure the survival of us all. Please watch this documentary, "A Silent Forest - The Growing Threat Genetically Engineered Trees" to learn how the forests of the world are at risk to the vulnerabilities and human control of genetic engineering. Mother Nature is tried and true, and has been for millions of years. Who are we to think that, as humans, we can make something better than Mother Nature can? Why do we need to? If you have chickens around your garden or homestead, you may be using straw for their bedding. We have an alternative to share with you that may save you time and money. If you've followed our website, you know we have shared many posts about the merits of hemp. So, we are happy to share another with you on a "new" way of using this versatile and very eco-friendly plant. You can use hemp bedding instead of straw for your chickens, ducks, goats, horses, hamsters, gerbils, or any other place where you would use straw or other bedding material. Hemp bedding is easy to use. It also decomposes in a matter of a few months, compared to the years it takes for straw to decompose, making it a good addition to compost piles. You can check hemp bedding for chickens out in the video below. You can find out more about hemp bedding and how to order it here. Have you ever wished that you could take a course in permaculture design? If you have, your wish is being granted! The Regenerative Leadership Institute is offering their 72-hour Permaculture Design Course absolutely free to anyone who signs up for it. For those who are interested in being certified in Permaculture Design, the Institute has a reduced (for a short time yet) and very reasonable rate for the certification process. Certification is not required to take the course, though. This course offers unlimited access to the Institute's video lectures on garden design, forest gardens, rainwater harvest, solar design, renewable energy, natural building construction and more. This is a great opportunity for those who are interested in being a part of "greening up the world" and living purposefully and sustainably. You can find out more about this great opportunity by visiting the Regenerative Leadership Institute website. Don't Spray Chemicals....Justs Get Ducks! Don't spray toxic chemicals on your garden to control the insect population. If you really don't want to share you garden with these little pests, just get some ducks! As you will see in this delightful video with P. Allen Smith, and shared via the Farm Raised Channel, ducks will get the job done quickly, without toxins, and provide a great deal of entertainment in the process. 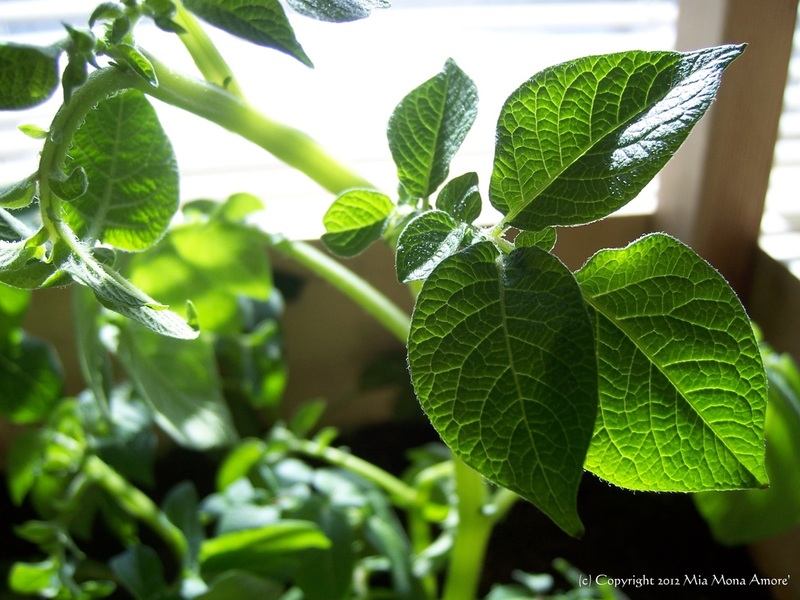 Did you know that growing your vegetables with wood chips and rock dust can more than double their size? This is a great little video that shows us how it works. Many thanks to Growing Your Greens for sharing this with all of us! When most of us think of forest, we think of rainforests. However, dryland forests are just as important as our rainforests are. Take a look at this great video from Permasolutions to learn more about how our forests keep our drylands working. A water-retaining landscape is a critical part of helping to correct the global problems of water shortages and imbalances. In seeing how one town addressed its problems of hydrological imbalance, we can see how important it is to create a landscape that will retain the water it's given through rain, snow, and natural waterways. With Sepp Holzer and Bernd Mueller, this video is a beautiful little gem of very pertinent information! What could be better than Forest Gardens and greenhouses? A Forest Garden in a greenhouse! We've found just the right greenhouse to use to make it happen, too! In fact, we think we may have found the best of the best in greenhouse designs. We'd like to introduce you to Growing Dome® Greenhouses. You can find them on our "Featured Favorites" page as a permanent part of the Sacred Earth Gardens area of our website. Growing 6,000 Pounds of Food on 1/10th an Acre? Growing 6,000 pounds of food per year on 1/10th an acre of land sound too good to be true, right? How about 400 species of plants, hundreds of eggs from chickens and ducks, and honey, too? Sounds incredible, and it is! Check out this great video on urban farming! It's a wonderful inspiration! 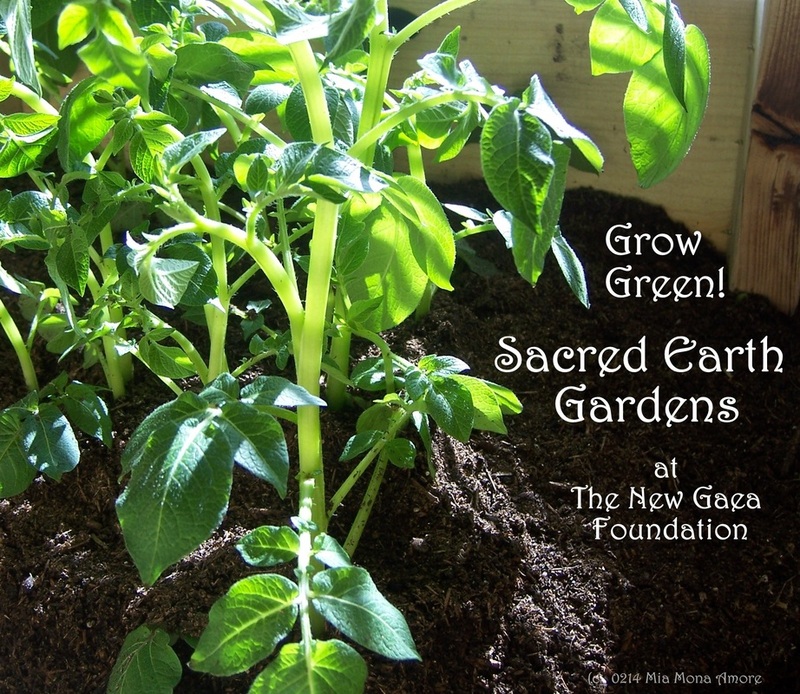 Sacred Earth Gardens has teamed up with Sacred Earth Organics and the Green Living Resource Center in a new Facebook page! We see so many great ideas on Facebook, that we felt it was waste to not share them with all of you. So, we created a page just for sharing "green ideas"! The new page is called "Grow Green, Eat Green, Live Green with The New Gaea Foundation. You can connect with it here, as well as on the sitemap, under the "Blog Log", and under the sitemap area here on this page. We hope you enjoy it! See you there! A Free documentary series in the making, here is the trailer for "Seeds of Permaculture". This documentary is still in the fundraising stage. Donate if you can. Watch and share the film when it is ready. Permaculture is a way of gardening for today that Supports future generations of gardens and gardeners! It just makes sense! Are the Summertime Bugs Bugging You? Sometimes we just can't live Peacefully with our multi-legged neighbors. They bite us. They get in our food. They carry diseases. So, if the bugs are bugging you, your pets, your garden treasures, your livestock, etc. this summer, give an all natural insecticide a try. For outdoors or pet areas, give diatomaceous earth a try. It's safe. It's inexpensive. It's environmentally okay to use. Diatomaceous earth is wonderful for taking care of fleas, ticks, worms - any insect that it comes in contact with. Yet, is causes no harm to birds, pets, kids, or the environment. You can use cinnamon or chili powder or oil to keep the crawling pests at bay - although care must be used when using cinnamon indoors, as it can stain. Peppermint (live or oil) is also good for deterring crawling creatures as well as mice. If you've got the crawly or flying pesky kind of creatures that you would rather not have, we highly recommend Orange Guard. We have used it safely and effectively for several years now, and have found nothing better. Orange Guard is a water-based, food grade insecticide (orange oil) that's safe for people, pets, foods, household, garden, and other uses. You can find out more about Orange Guard in the video below or go to the Orange Guard website. There are lots of ways to avoid encounters with insects and arachnids that are natural and pose no health hazard to people, pets, or the environment. So, if your Peace efforts with the multi-legged world fail, you can still stay natural, healthy, and environmentally friendly. Please read more about this interview at the above link. The music/singing of plants through the use of electrodes is a magical experience brought about by the use of gentleness, Love, and a little science. Research in plant communications has been underway since 1976 at Damanhur - an eco-society based on spirituality and ethics. To give a voice to the plants in this way is a wonderful example of the right place of a human being within the scope of true Oneness. You can find out more about Damanhur here. You can read more about the "Amazing Phenomenon of Singing Plants" here. Can we grow hemp in our gardens? In some states, legislation to legalize industrial hemp has been passed, in others it is still pending. But the hold up on making hemp legal for cultivation is still with the federal Drug Enforcement Agency. If you would like to see the unjust and outdated ban on growing hemp lifted, please contact your congressional representatives and let them know. As we raise awareness, perhaps we can lift a ban that hurts rather than helps our people and the environment. During our Earth Day celebrations, we shared a lot of great information on the benefits of Forest Gardens. These gardens can be greatly enhanced through the use of aquaculture - adding a pond. Take a look at this wonderful video from the folks at Permaculture Artisans. It's great! And, don't forget that ponds make great homes for frogs and toads. These little guys are not only incredible pest control agents, they are also invaluable indicators of the health of your garden. You can find out more about Permaculture Artisans here. We have a couple of tips for choosing trees for carbon sequestration up on the Green Living Resource Center blog. Check them out! Are you planting trees for Arbor Day this year? Have you thought about planting fruit trees? They are a good consideration from a couple of aspects. First, they are deciduous trees. Deciduous trees remove more carbon from the atmosphere than coniferous trees do. Now, fruit trees are pretty small trees for removing carbon for us, but numbers count and the more we plant the more carbon they can handle. The second consideration in planting fruit trees is the food that they provide! We can always use more food for ourselves, our neighbors, our community, even our pets and livestock. The third consideration in favor of planting fruit trees is their beauty. With blooms in the Spring, ripening fruits in the Fall, and watching the process happen all Summer, fruit trees add to the asthetics of any property. We think fruit trees should be a part of every Arbor Day. For those of you who have never planted a fruit tree before, here is a video that will give you some easy to follow tips on how to do it. One of the most inspiring concepts for sustainable food production, on a large scale or a small backyard garden, is that of 3-dimensional gardening. Instead of simply growing outward in flat horizontal structuring, imagine a garden that is both horizontal and vertical with multiple layers of plant growth all working together in perfect Balance and Harmony. If you can imagine this, then you have imagined a Forest Garden. You can learn more about them and see examples of different types of Forest Gardens in our "Articles and Other Things" area. Are the Peacocks too Noisy? If the peacocks make too much noise for you to use for your insect control, how about ducks? They are more quiet, more animated, more fun to watch, and VERY effective for insect control both in and out of the water. Check out our "Featured Favorite" on these little quackers. Don't Spray Those Noxious Weeds!!! Don't spray chemicals on those noxious weeds! You can use goats instead. You don't even have to buy goats to do the job. You can rent them! Check out our "Featured Favorite" to learn more. Unfortunately, this video is not loading for us. We will try it again later, so check back again to see the last part of the "GMO Trilogy - Unnatural Selection". GMO Trilogy - Unnatural Selection (part 5 of 5) - Watch more Videos at Vodpod. Wishing you could find an all natural pesticide? How about a peacock or two? Not only are peacocks (peafowl) magical and mystical birds, they are great "bug hunters", too! Turn them loose in your yard, pastures, or fields and they will take care of the unwanted insects in short order. They are also very good at sounding the alert if snakes or other intruders are nearby. Peacocks require no more care than any other barnyard bird - clean food and water, a safe place to roost, and lots of Love. Who can resist their mystical songs and magical feathers? Using peacocks for insect control is a far more environmentally sound method than using toxic chemicals that do harm for years after they are applied! Please note: All blog material posted by Sacred Earth Gardens is copyrighted by The New Gaea Foundation.